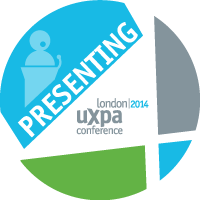 I’m happy to announce I will be presenting an updated version of the Emotional Strategy for Balanced UX Design at the upcoming UXPA International Conference in London, July 22, 2014. Win User Loyalty by Targeting Logic AND Emotions looks at why emotions are such an important factor to consider at every stage of design. It also explains when, where, and how to use emotions by looking at The 4 Stages of Accomplishing Goals. The 4 Stages explains HOW we experience everything. After the conference I will post up the slide deck to Slideshare and hopefully I’ll have link to a video recording of the session to share as well. Hope to see you in London. Next Next post: Big Data Only Tells Half the Story, If You’re Lucky.